The second stage in the expedition series is set to Pamir in July–August 2015, a mountainous area in Central Asia known as the “Roof of the world”, forming the junction between the Himalayas, the Tien Shan, the Karakoram, the Kunlun and the Hindu Kush ranges. 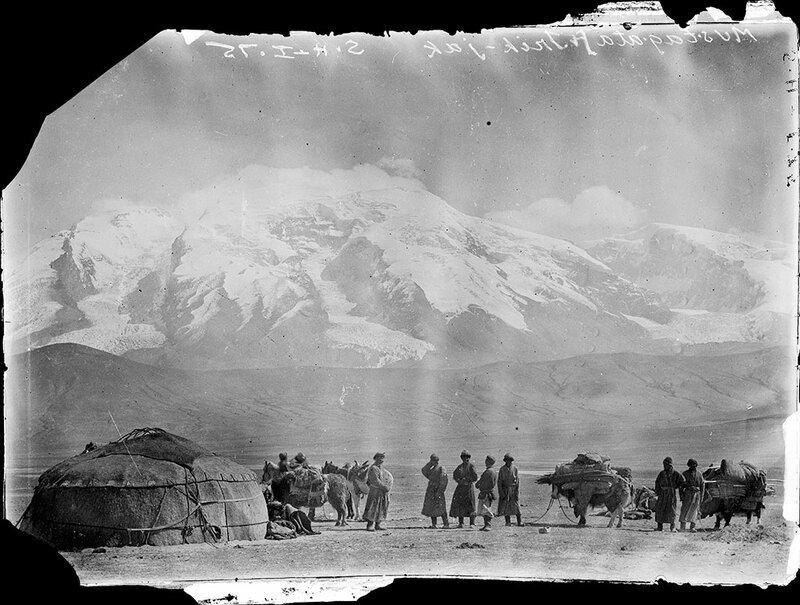 During Hedin’s first large Central Asian expedition he explored this area in 1894–1895. Our plan is to follow, in part, Hedin’s route in Pamir – a journey that will take us through Kyrgyzstan, Tajikistan, Afghanistan and China. Sven Hedin. © The Sven Hedin Foundation. 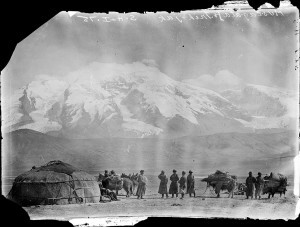 Hedin spent extended time with the Kyrgyz in the eastern part of Pamir, while studying the glaciers of Muztagh Ata, “The Father of Ice-Mountains” (7,546 meters) in Xinjiang, China. He also traveled through more remote Kyrgyz settlements in the Afghan “Little Pamir” of the Wakhan Corridor. This is the absurdly looking, narrow finger in the northeast of Afghanistan that extends to China. The Wakhan Corridor is a result of the famous “Great Game” – the political power struggle between the Russian and British Empires for supremacy in Central Asia during the 19th century. Wakhan was more or less forced upon Afghan control to create a buffer zone between the two rivaling empires in the north and south. When Hedin entered the far eastern end of the corridor through the Wakhjir pass from China, he was to walk straight into the Anglo-Russian Boundary Commission of 1895 and the final historic settlement of the Great Game. He tried to keep neutral; dined alternatingly with generals from both sides and was to become a playing card in this Game, which both sides wanted to have on their hand. The Wakhan Corridor once served as an integral part of the fabled Silk Road connecting the east to the west. Today the borders have been closed for almost 100 years, creating a dead end, making the Afghan Pamir one of the world’s most isolated regions. Today the only way to reach the Wakhan Corridor is to enter from the Afghan side in the far west along the Panj River. If you drive eastwards into the corridor, until the dirt road ends, it still takes seven more days of trekking to reach the eastern end. This is the Little Pamir where a small number of isolated Kyrgyz nomads still reside. 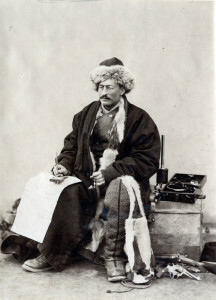 Hedin only traveled this upper part of Wakhan, but just one year later in 1886 the Danish lieutenant Ole Olufsen (1865–1929) set out on the first of two Danish Pamir expeditions where the main target was the lower Wakhan Corridor along the Panj River. Olufsen was the first European to collect ethnographical information on the Wakhi agro-pastoralists inhabiting this area. Hedin’s collection of roughly 15,000 photographs has been buried for over a hundred years in the archives of the Museum of Ethnography in Stockholm. The large undertaking of digitizing these old glass plates begun in 2010 and is still ongoing. We will be the first to take advantage of this unique material. Olufsen’s photographic collection, that we also have access to, is held at the Archives of the National Museum in Copenhagen and is of equal historic value. We will search for the exact locations, where Hedin’s and Olufsen’s photographs were taken, and if possible capture new images that precisely match the old ones. This gives us a visually striking comparison spanning 120 years, revealing changes in both landscapes and culture. 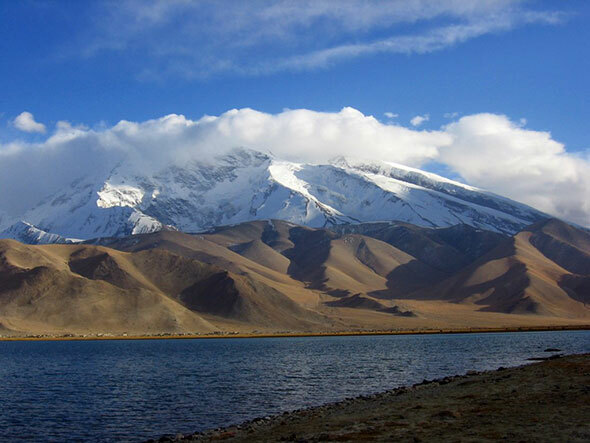 Muztagh Ata – The Father of Ice-Mountains in Xinjiang, China. © The Sven Hedin Foundation. Our first objective is to study Muztagh Ata and determine how far its glacier fronts have retracted since 1894. By repeating Hedin’s photographs of the glaciers, georeferencing his map sketches in a GIS and comparing them to satellite images, we hope to be able to reconstruct what the glaciers looked like 120 years ago. This study is done in collaboration with glaciologists at the Department of Physical Geography and Quaternary Geology at Stockholm University. Our results will have a unique scientific value in climate change research, since traditional studies based solely on aerial photography only reach back to the 1960s. We will use the same methodology to reconstruct and study Hedin’s attempts to ascend Muztagh Ata. He made four attempts along two different routes; one attempt towards the main summit and three attempts towards the slightly lower northern summit, where he claimed to have reached a maximum height of 6,300 meters. This was an astonishing feat and one of the highest ascents in the world at this time, but has later been disputed with claims that Hedin only reached 5,800 meters. 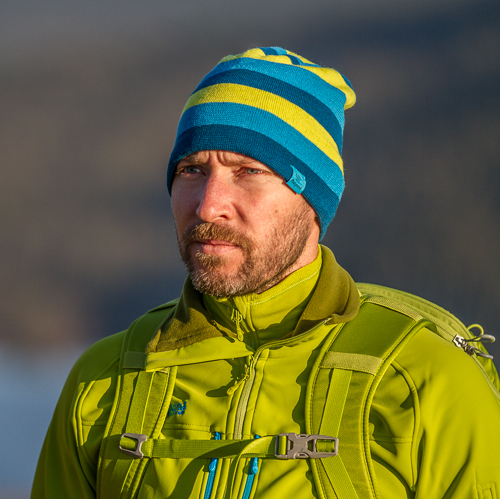 To settle this question with scientific rigor, we will combine our GIS with field observations while attempting to ascend the main summit along the same historical route as Hedin did. Our results will be of highest importance to the history of mountaineering, since we hope to conclusively decide if Hedin had the Swedish altitude record for seven years or 60 years. Our second objective is to follow up on Hedin’s anthropological work concerning the Kyrgyz nomads he as a lone westerner lived closely with for months and came to respect and develop strong friendship with. We will conduct repeat photography in the Kyrgyz area of Little Kara-Kul and Muztagh Ata in Xinjiang. The repeated photographs will be supplemented with anthropological information gathered by traditional methods. The living conditions and traditions of the nomads in this area have been greatly affected by the modernization program enforced by the Chinese authorities. To contrast the transformations in this area, we will also visit the more remote Kyrgyz settlements in Little Pamir in upper Wakhan. On our route to Little Pamir we will apply the same concept and methodology we use for Hedin on Olufsen’s anthropological work concerning the Wakhi agro-pastoralists in the lower Wakhan. Repeating Olufsen’s photographs is our third objective.